1 of 2 In a medium saucepan, combine raspberries, sugar, vinegar, ginger, nutmeg and cloves. Stir in 1/2 cup water and bring to a boil, crushing raspberries with a wooden spoon. Simmer, uncovered, 10 minutes, stirring occasionally. Take off heat; stir in butter. Keep warm. 2 of 2 Heat oven to 350 degrees F. Place a grill pan over medium-high heat. Season the pork chops with salt, pepper and sage. Lightly grease grill pan and grill pork chops 5 minutes per side. Place chops in baking dish and bake for 10 minutes or until internal temperature registers 150 degrees F on an instant-read thermometer. Allow to stand for 5 minutes. 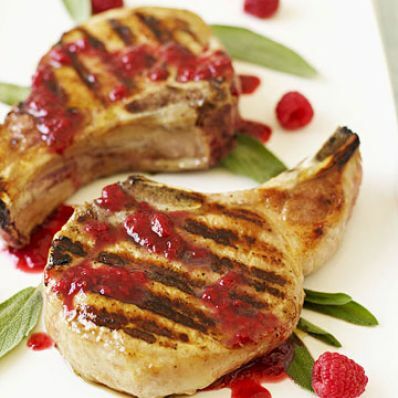 Serve pork chops with warm sauce on the side. Per Serving: 6 g sat. fat, 2 g fiber, 31 g pro., 16 g carb., 13 g Fat, total, 94 mg chol., 374 mg sodium, 307 kcal cal.